Optical Properties of Solids covers the important concepts of intrinsic optical properties and photoelectric emission. The book starts by providing an introduction to the fundamental optical spectra of solids. The text then discusses Maxwell's equations and the dielectric function; absorption and dispersion; and the theory of free-electron metals. The quantum mechanical theory of direct and indirect transitions between bands; the applications of dispersion relations; and the derivation of an expression for the dielectric function in the self-consistent field approximation are also encompassed. The book further tackles current-current correlations; the fluctuation-dissipation theorem; and the effect of surface plasmons on optical properties and photoemission. 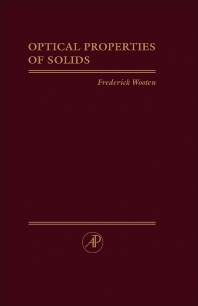 People involved in the study of the optical properties of solids will find the book invaluable.